Delightfully spooky Jodee Taylah is an award-winning artist and illustrator. With the help of Australia’s Love of Books, she has just published a book of her dark drawings. She says her work is “a blend of the fantastical and creepy loveliness” and she is “inspired by stormy days, unusual landscapes, antiques and pocket-watches”. Appealingly gothic art. A lavishly illustrated book of horrors, Children of the In-between is more than just a picture book. This is a journey you’ll be dying to go on. 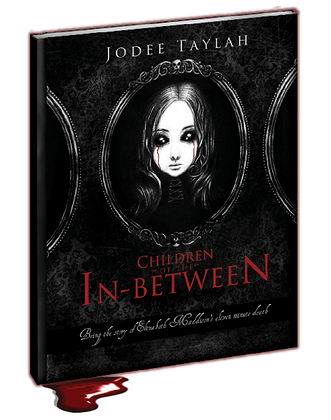 68 pages of full colour illustrations, and a story to keep you thinking the whole way through, Children of the In-between is the debut book from the twisted mind of Jodee Taylah. Rated ‘DH’ for DARKLY HORRIFIC, this book includes adult themes of death, suicide, murder, drugs and other dark and disturbing things. So, please don’t read if you are prone to wetting your pants. Posted by Gothic.net on Thursday, July 26th, 2012. Filed under Books, Headline, Video. You can follow any responses to this entry through the RSS 2.0. You can skip to the end and leave a response. Pinging is currently not allowed.